There is perhaps no more powerful selling tool than a good story. The great thing about stories is that even if it’s someone else’s story originally, when you tell it, it becomes yours, and if it’s a good story, it makes you look good. Here at Passion Spas, we know we have a good story, and we want to give it to you. We want our dealers to thrive in today’s marketplace; we want you to look good to your customers. So here’s our story. Take it and make it your own. It’s called the 6 Selling Points of Passion – 6 ways that describe how we identify ourselves and our work. Over the coming weeks, we’ll be dealing with each selling point in turn. In today’s post, we’ll be focusing on selling point numero uno: Professional Design. 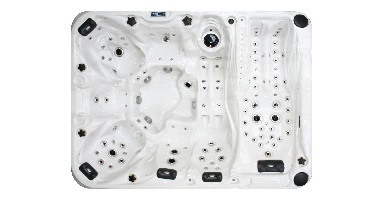 Hot tubs have come a long way in terms of technology and durability. So if the inner workings have progressed so far, why do many spa manufacturers think it’s okay to slap the same tired and outdated designs on the outside? We don’t. Passion Spas goes to great lengths to keep serving up products that will provide that “wow” factor – the initial hook that will capture your customer’s attention and imagination when they step onto your sales floor. That’s your opening. That’s the moment when they decide they want it even before you start selling it to them, and that’s also the moment when your job’s already halfway done. A careful handling of every detail. Strategic positioning of lighting, jets, and features. Each and every spa is a work of art, which is why you shouldn’t be surprised if your customers end up walking past everything else on the showroom floor and go straight to the Passion Spas on display. If you haven’t already, maybe you should give it a try. We won’t try to lock you into a long-term, exclusive contract because we firmly believe that if you try one of our spas – just one – you’ll understand the huge potential of partnering with Passion Spas. That gives you the opportunity to experiment a little bit. You’re the expert on your local clientele, so why don’t you pick one of our spas and run it past them to see how it does in your market? If that sounds like a good idea, you can get in touch with our senior representative Jane Grady by calling our toll-free number 855.355.3088 or by e-mailing info@passionspasusa.com.